Double Camping Hammock Just $13.99! Down From $60! You are here: Home / Great Deals / Amazon Deals / Double Camping Hammock Just $13.99! Down From $60! Hurry over to Amazon where you can get this Double Camping Hammock for just $13.99 down from $59.99 PLUS FREE shipping with Amazon Prime or for orders $25 or more! This Camping Hammock is made of the new 210T Parachute Nylon fabric, soft, comfortable, breathable and super durable. Suitable for 2 persons. A great gift for traveling, camping, backpacking, hiking, or just use it in the back-yard of your house, beach for relaxing. Enjoy the happy time with your family or friend in the hammock! Suitable for 2 Persons: Super strong, SHINE HAI Camping Hammock could support up to 400~500 lbs, suitable for 2 persons. With the dimension of 118″(L) x 78″(W), there is still plenty of room when you lay down with your family or friend. Easy to Set Up: There is everything you need for quick and easy hanging setup. It will take less than 3 minutes to hang your camping hammock on a tree or nearby objects by using the included ropes, strips and carabiners. 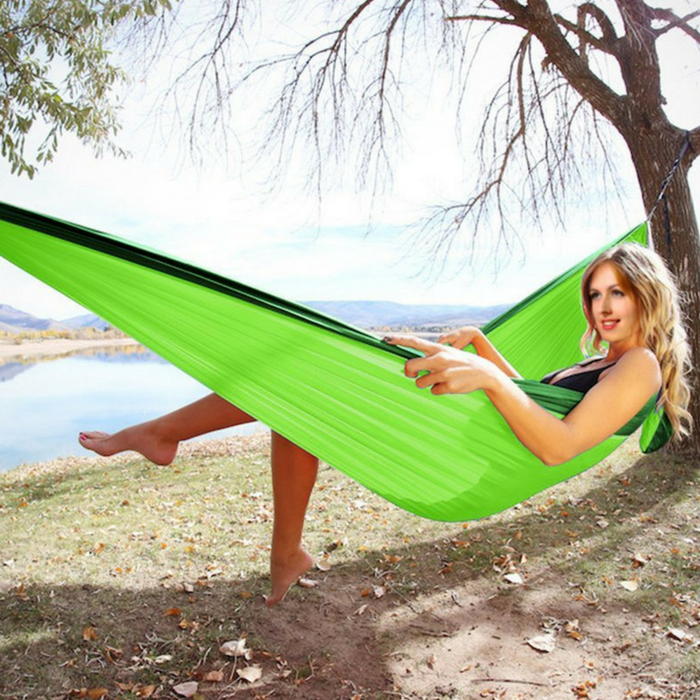 Super Lightweight: Weigh 2.2 lbs, come with a carrying bag, the hammock is super easy to carry and store, ideal for traveling, camping, backpacking, or just hanging it and relaxing on it in the patio or garden. Soft and Comfortable: Made of the 210T Parachute Nylon, this hammock is much softer and more comfortable than the traditional one.